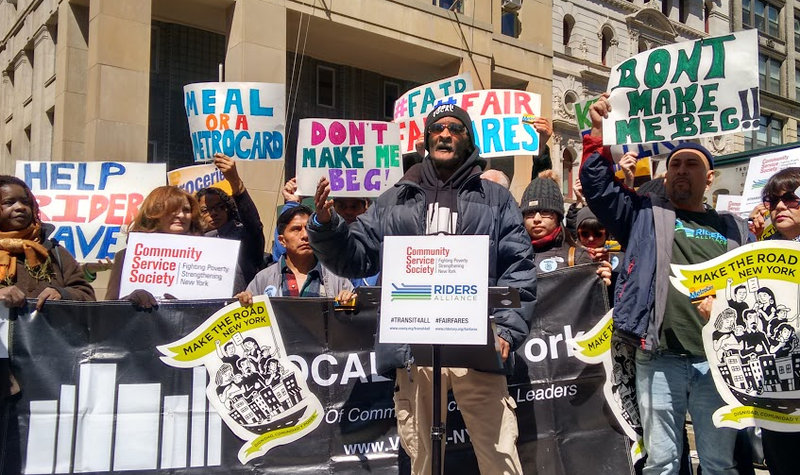 The Riders Alliance and the Community Service Society of New York are calling for half-priced transit fares for New Yorkers between the ages of 18 and 64 who fall below the federal poverty level. The coalition, which includes Public Advocate Letitia James and Comptroller Scott Stringer, rallied outside City Hall yesterday for discount fares. Drawing on data from the Community Service Society’s most recent “Unheard Third” survey of the city’s poorest residents, the joint report shows that low-income New Yorkers — particular in black and Latino communities — are more transit-dependent than average and bear a disproportionate burden of fare increases. 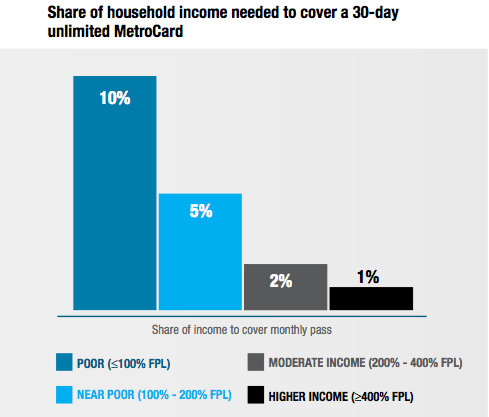 Households at or below the federal poverty level must spend at least 10 percent of their income to cover the costs of 30-day MetroCards. For some New Yorkers, the cost of a fare can mean passing up on job opportunities or making difficult choices to cut back on basic necessities like food or medical care. Holding signs with messages like “Don’t Make Me Beg” and “Meal or a MetroCard,” riders at yesterday’s announcement said they need some relief at the farebox. Cities including London, San Francisco, and Seattle run similar discount fare programs, the report notes. The total cost of providing half-priced fares to the 800,000 New Yorkers living below the poverty line would likely be around $200 million, and the groups have proposed a number of potential revenue sources, including the Move NY toll plan, raising the state gas tax, extending the state’s current “millionaire’s tax,” or direct city subsidies. The report doesn’t specifically recommend whether the MTA or the city should administer the program, but it does note that NYC’s Human Resources Administration already spends $48 million to distribute MetroCards to low-income New Yorkers for certain trips. The cost of the reduced-fare program could be offset in part by reducing the need for the HRA’s MetroCard program and by lower rates of fare evasion, the authors suggest. “We think this is something which is doable, and something the city not only has the power to do, but can afford to do,” said CSS economist Harold Stolper, who co-authored the report. I hope this campaign doesn’t forget the growing number of poor people outside the city’s border. They already have very long commutes into the city, with long county bus rides to just reach the the subway termini. MetroNorth, LIRR and MTA Bus are just too expensive. The disparate burden on poor people is one of the reasons that a sane society would subsidise its subways 100% out of taxes and have no fare at all. The sad fact is that our twisted society in which taxes are demonised will never get to that point. Absent such a rational policy, it is hard to imagine how a means-tested low-fare system could be implemented without 1) draining the system of revenue, and 2) creating a black market. P.S. – I will admit that my first reaction upon looking at that picture was to think that that was Sid from Seinfeld, the guy who moves cars from one side of the street to the other, and for whom George so disastrously subbed in one episode. the expected subsidy is $70 million per year. I’ll argue that a solution that increases mobility for Many more low income people would be building Protected bike lanes. $70 Million builds 140 miles of protected bike lanes. Imagine 5 years at 140 miles per year ( instead of th current 15 Miles ) . Thats 700 Miles of protected bike Lanes Added to the 100 Existing. The transit deserts would all be connected, 800 Miles !!! 800 Miles of protected bike lanes would transform mobility for everyone and benefit the Working Poor immensely. I was in this exact situation whenever I thought of looking for summer jobs in college. At the time most of the jobs a college student could expect to get paid around $3.50 to $4 an hour. After taxes maybe you would see $110 to $130 or so per week. Subway fare at the time was $0.75 but I lived in what was then a double carefare zone. 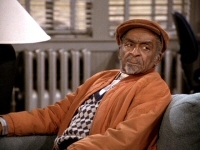 My weekly subway/bus fare of $15 would have amounted to about 12% to 14% of my take home pay. Add in lunch money, plus money to buy decent clothes for work, and I concluded looking for a summer job was a waste of time. Had we not gotten rid of double-fare zones the poorest people would now be looking at spending more the 20% of their pay just getting to work. That’s not even remotely acceptable. Correct. If you take the Manhattan Bridge, if you ride the subway, the government charges you $2.75. If you want to drive across, creating congestion and pollution, the government lets you get away with that for free. That situation should be exactly the opposite. Of course, tell that to a car driver and they’ll typically answer that they pay a lot more than $2.75 for gas, insurance, and other car related expenses. No doubt this is true, but those are inherent expenses of the mode they choose to take. None of what they pay for their car goes towards covering the problems their driving creates. NYC used to have zones where you’d have to pay double for a subway ride? Furthermore stuff like insurance and car maintenance aren’t actually paying for the public infrastructure they’re using. Driving is hugely subsidized but car drivers lose their minds when you try to explain this to them. You’d have to pay once for the bus to the subway, then a second time for the subway. In addition to the lack of free bus-to-subway transfers citywide, the Rockaways used to be a double-fare zone. You’d have to pay a second fare to exit, and two fares to enter. Also, I believe that, before 1940, there was an additional charge to transfer between the divisions, like from an IND line to a BMT line. The system costs a certain amount to operate and after a point, costs more to operate to add more service. It sounds great to provide discounted service to the poor, or to college students, or others. But someone has to pay for that lost revenue and/or the cost of providing additional service. Its a choice elected officials need to make. Do they want to spend limited $ on this, or something else. Its not unlike the current discussion about “free” tuition for college students. Its not free, except for the student (or rider), and society pays one way or another. As far as I know, the Rockaways were the only place where people ever had to pay “two fares” to ride the subway. You had to drop a token in the turnstile when you exited any Rockaway stations, and you had to deposit 2 tokens to enter in the Rockaways. This is irrelevant even if true, you’re comparing national statistics to a bridge which we paid to have four electrified tracks on. We waited 18 years for them to finish. Those trains damn well better be packed now. Can’t say I agree with all the methodology, but it is at least a different viewpoint from what’s typically seen here. In general, car subsidies are likely too different based on region (and usage) to look at overall numbers like this. How much a particular driver pays in vs. gets back can vary wildly, even in the tri state area, depending on the state you live in and the efficiency of your car (gas tax), usage of free vs. paid crossings (does this driver take the tolled crossings most of the time, or do they usually use the free east river bridges?). Do they pay for parking/have a driveway or do they park for free? etc. For one, the costs of depreciating and financing capital costs ultimately are operating costs. More importantly, even if the public costs of maintaining car-friendly road infrastructure are lower than maintaining transit infrastructure (dubious claim at best), transit still reduces private costs of trips perhaps by perhaps a factor of 10. Automobile fluffers in politics inflate the costs of providing transit and then claim it’s not efficient. Let’s see them start pushing for OPTO and getting rid of the railroad labor and work rule extremities. When they make the ride require $1.11 in subisides, they’re paying for a lot of stuff we shouldn’t or don’t need like an extra body on every train and staff around the clock in nearly every station. Anyway, comparing a subway trip to a car passenger-mile is weak even going by that methodology. A typical subway trip is ~4 miles long, making the per-passenger-mile subsidy closer to 27¢. The comparison is irrelevant because of limited space and the limited population of drivers. Cars must be parked 95% of the time (unless they are taxis, in which case a driver must be paid), and they also hog a lot of space while moving, and much of NYC is built at higher densities than can accommodate universal car use. Besides, much of the population cannot drive. You might try making a case for jitneys, although there are a lot of problems with that mode as well. Those numbers leave out a big cost of driving—namely the huge US military presence required to ensure Joe Sixpack has cheap gas for his SUV. The Middle Eastern wars cost $2 trillion and counting. In general, US military spending accounts for over half of discretionary spending. Last year we spent close to $600 billion on the military. Easily 2/3rds of this wouldn’t be needed if we didn’t maintain a presence in the Middle East. That’s a more or less $400 billion subsidy to driving, or close to 10 cents per passenger mile. And that study failed to take into account the huge costs long distance trucking enact on us in terms of damage and pollution. Granted, it’s not passenger movement, but the subsidies to trucking are motor vehicle subsidies nonetheless. You also have the huge underestimate in driving subsidies. The amounts spent on roads look suspiciously low to me, probably because we’re not even spending what’s close to needed to keep them in good repair. When they fail prematurely, we’ll be looking at huge replacement costs. In other words, like a lot of other things, we’re passing the costs of roads onto our children and grandchildren because people don’t want to pay the true cost of driving. Finally, you have the social costs of the low density living arrangements which driving enables. This needs to be counted. Utilities serving suburbs and exurbs cost us all in the form of higher average utility bills. You have the obesity problem and mental health issues from isolated living which these low density living arrangements cause. One other problem with that study is the results can’t be applied universally. It’s an overall average for the US. If we looked at the cost of transit versus driving in Nebraska, transit would look really bad. If we do the same in NYC where the social costs of driving are huge, even NYC’s transit run by expensive, overstaffed union labor starts to look good. A properly run transit system would look even better. Besides that, once you pass a certain density, it’s moot whether driving is cheaper overall or not because universal driving can’t work. You last point is really the most important one. Even if we grant that the total cost of driving comes to 22.4 cents per passenger mile, that average is based mostly on fairly long trips. When you do lots of short trips in urban areas, the cost per mile goes way up. That’s especially true if you do only short trips and therefore can’t amortize the annual cost of a vehicle over 15,000 or 20,000 miles. Someone who owns a car in the city but only drives a few thousand miles per year locally might be looking at a cost per passenger-mile of a few dollars. That means in the places where transit makes sense, the cost to the end user could indeed be lower by a factor of ten. Haven’t we discussed this in the past? The whole war for oil thing is pretty outdated; the vast majority of US oil comes from the US, Canada, and Mexico, not the middle east. Subsidies to trucking are a completely different question from passenger movement, and the costs associated are different as well. Utility costs in cities like NYC are not high because of suburban communities, that’s not a thing. My attitude is, if you can’t make a business case for owning a car, don’t own one. A few people really can, regardless of how far they drive. A car share system makes much more sense than a nearly 1:1 adult-to-automobile ratio. Of course, that attitude doesn’t work so well in no-transit suburbs. It’s the same problem as the and war on drugs-driven police state and its baby the security state. People make money feeding at the trough, from the lowly prison guard to the consultants who sell Bratton’s fascist ideas to cities from Baltimore and Bogota. I don’t think people are inflating the cost of transit to fluff up cars; “getting rid of the railroad labor” is the issue; no politician wants to do that, not because of cars, but because it’s not a good move to anger the unions. Okay, at 27c/mile, we can try for apples to apples. If a driver takes a tolled bridge or tunnel; about 35% of the toll is surplus (beyond maintenance and capital costs), so $1.94; divided by the same 4 miles; that’s 48c/mile. That’s the high end of course, on the low end, we have a driver who takes a free bridge, and finds free parking, for whom the costs is only gas tax, or $0.33/mile under the subsidy. So the subsidy can be either a deficit or a surplus; it depends. So, if I pay a cash fare to take a subway ride for approximately two stops (~1/2 a mile? a mile? ), the TA is clearly profiting on my trip and I’m not being “subsidized”? This is cash flow masturbation. These are just averages. In reality most of these costs are different forms of overhead that would be there regardless of passenger/use volumes. For drivers, sure, some are being snowed with tolls while others are being given virtually free rides – if you want to go crazy, no doubt sometimes paid for with disability and other social services funds. 😀 To top it off, some gas tax and toll revenue is diverted from drivers’ infrastructure to transit, but not more than is diverted from general tax funds to roadways. This is what makes the war on pay-as-you-go driving so bizarre; far from just hurting transit users, politicians who defend the status quo are defending screwing one class of drivers at the expense of another class of drivers. I don’t think they’re doing it to “fluff up cars” either, but the decisions of car-coddling politicians inflate the cost of transit, deliberately or not. If we are going to demand a body in every station for dubious “safety” or near-pointless customer service, fine. But it’s a bit silly to require such things and then hold it against transit systems’ finances as people like the anti-think^H^H^H^H^Hplanner do. I find it unlikely improved efficiency even needs to net fewer jobs. I said nothing about getting rid of labor, we simply need to change how it’s utilized. We could have a bigger transit network for a similar amount of labor-time! Thanks to Saudi Arabia keeping a glut of oil on the market, domestic US production is pretty much dead. Besides that, even if it isn’t, I’m not seeing any large cuts in military spending this year, or the US disengaging from the Middle East. So long as we obtain some of our oil from there, we will continue the military spending like drunken sailors. No but look at Lilco. They charge the same per kW-hr whether you live in a denser inner ring LI suburb or all the way out in Suffolk county. Arguably those living in much less dense areas of LI are being heavily subsidized by those living near the NYC border. The hard fact is in most of the US utilities are legally required to serve an entire area, and they can’t charge more in places where a mile of utilities serves fewer people. This means everyone pays for the less dense development. And cars are what makes this less dense development possible. Therefore, it should be counted as yet another indirect subsidy of driving. “US production is pretty much dead. ” Look again. Li electricity rates are actually high due to a Nuclear power plant that was built, then dismantled due to NIMBYs without ever being turned on. It has nothing to do with sprawl, as though less dense than NYC, LI is pretty darn dense compared to the rest of the US (and more than dense enough for the utility grid) This isn’t Kansas. And in response to the objections from “car people” – just think how much traffic this would take off the road, making things easier for them too! Criminal justice advocates gathered outside City Hall this morning to call on Mayor de Blasio to fund discount transit fares for poor New Yorkers.